The Crimson sit at the top of the Ancient Eight after two straight victories over Dartmouth. Harvard will seek to extend its winning streak this weekend as it travels to face Yale on Friday and Brown on Saturday in its first full Ivy League weekend of the season. The Crimson (9-6, 2-0 Ivy) has been rolling since a two week break in the middle of December, returning from the break to win five straight, three of which came on the road and one at No. 14 California, which became the highest ranked opponent defeated by an Ivy League team since Harvard famously beat No. 1 Stanford in the first round of the 1998 NCAA Tournament. Over the five game stretch, the Crimson has thrashed teams by an average of 17 points. 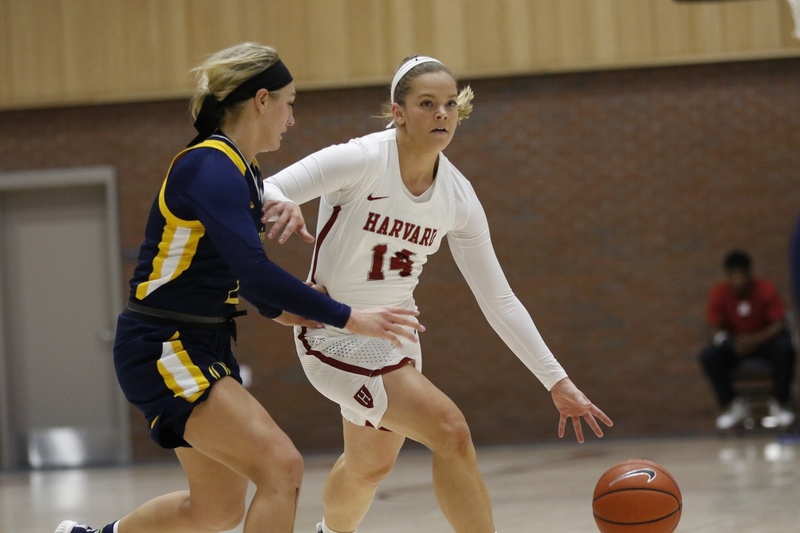 Harvard blanked the Big Green in the first quarter of that first game against Dartmouth two weeks ago, setting the tone for the dominant defensive performance that spurred the Crimson’s sweep of its rivals to the northwest. In the two wins against Dartmouth, Harvard gave up just 103 combined points. Those defensive performance, though, came against a team that averages just 62 points per game, seventh in the Ivy League. Yale (11-6, 1-1) and particularly Brown (9-9, 1-1) will provide a different type of threat. The Bulldogs are led by junior guard Roxy Barahman and freshman forward Camilla Emsbo, who Head Coach Kathy Delaney-Smith pointed to as a potential problem on the boards. Indeed, Yale ranks 58th in the nation in rebounding margin at +5.1, second in the Ivy League to Penn and just a hair ahead of the Crimson, which ranks 64th with a +4.8 margin. After slaughtering Dartmouth on the glass 50-34 and then 47-31, Harvard will feel that it has a good shot at neutralizing Emsbo, who averages 9.1 rebounds per game. Bush, a 5’11” sophomore forward, leads the Crimson in rebounding with 8.7 per contest. But she and 6’3” junior Jeannie Boehm will have their hands full with Emsbo, who towers over both of them at 6’5”. Rebounding is less likely to be a problem against Brown, as the Bears’ -5.1 rebounding margin makes them the 48th worst rebounding team in the nation and worst in the Ivy League. But Brown brings other challenges to the matchup with Harvard, as in the Ivy League only the Bears outpace the Crimson’s 68 points per game. Most of Brown’s offensive firepower comes from junior guard Justine Gaziano and senior guard Shayna Mehta, who average a combined 36.8 points per game and have hit 41 threes apiece. To Delaney-Smith, the difference in styles is not all that concerning. This is the second of three road weekends for Harvard before they come home to face Penn and Princeton, the conference’s other two favorites, in two weeks. Raster believes that it is key for the Crimson to keep rolling heading into that big weekend. “Our goal is to go 4-0 in the next two weekends to go into Penn and Princeton undefeated in Ivy League and to stay in the #1 spot in the league,” she said.